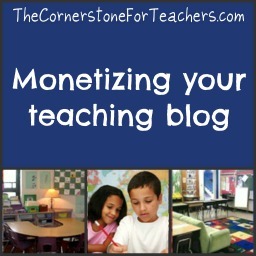 If you have a website for teachers and educators, there are lots of ways you can make money from your blog! On this page, I’ll share what I’ve learned about affiliate programs, Google Adsense, other ad programs, paid links, disclosing advertisements and sponsorships, and more. Is it worth it to place ads on my site? It can be, but you need to think very carefully about it. Ads are annoying to readers, so you should be compensated well for any advertisements that you place on your site. The idea is that you will have just a few ads that pay well instead of cluttering up your site with low paying ads. By accepting ads on your site, you’re sharing your online reputation and integrity, so think carefully about who you want to partner with. Having a company’s link on your site sends a message that you endorse and believe in that company, so be selective about who you work with. I did not accept any sponsors on this site for years, and then it took me several more years to get quality sponsors. I can say without a doubt that it was worth the wait. Set the precedent now that your website real estate is valuable. Sidebar and footer space is limited: use them to promote your own products or resources until you can attract worthwhile sponsors. What affiliate programs can I use? You can wade into the blog monetization waters through affiliate links. An affiliate program pays you a percentage of sales each time people click from your site to theirs and buy something. The most popular affiliate program is with Amazon. Each time someone clicks from an Amazon affiliate link on my site and buys a book I recommend (or any item, actually), I make a small percentage at no cost to them. It’s a wonderful program and you can make decent money with it. The only other affiliate program I participate in is Teaching Blog Traffic School. But there are many more, so ask around and see what options you have. Keep in mind that the FTC requires you to have a disclosure policy on your site which clearly says there are affiliate links on your site and you make money from them when people click through. Failing to do this can result in your blog being disabled by your server. Is Google AdSense worth using? Yes, absolutely. I was skeptical at first, but as my traffic increases, so does my ad income. What I like about AdSense is that it’s easy to customize the look and size of the ads and inserting them into the site is easy. There’s even a free WordPress plugin that does it for you, called Why Do Work? I also like being able to track clicks and money earned in real time. How can I get sponsors to buy ads on my education blog? AdSense is a good first step: I advise new bloggers to begin with that. The next step is to set up a sponsor/ad rate page. I waited YEARS to do this and within a few hours of having the page up, I began to reap the benefits and wondered what took me so long to get it together! Actually, I know why I put it off–I had no idea what to charge. I’ll address that below, but the short answer is this: pick a set of rates just to get that sponsor page going. You can (and should) adjust it over time to see what the market will bear. But without an ad rate page, you don’t have a starting point for negotiations. Once you have an sponsor/ad rate page up, you can query different companies that you see advertising on other blogs in your niche and send them the link to your page for more info. When your site really gets going, you’ll have lots of email inquiries about purchasing links and ads on your site. Many of them won’t be legitimate, and you can weed those out by simply sending them a link to your ad page. The ones who aren’t interested in having a real business relationship will disappear. How much should I charge for ads on a teaching blog? Unfortunately, there is no guide for this or set standard. It’s really, really hard to figure out what’s fair and reasonable with some many variables in place: the niche, the readership, the traffic, type of content, etc. As far as sidebar ads…this is the most transparent article I have found on the topic of pricing sidebar ads. Basically it says that if you have 500 site visitors a day, you can charge $50 per ad per month. That works for this blogger’s niche. However, every niche is different and education is a low-paying niche, in my experience. According to this article, I should be charging $400/month for a sidebar ad and I can’t imagine getting any takers on that right now. I price according to what I think my blog space is worth. The most expensive thing you can buy on my site is a blog feature which is an entire post about a company’s site/product. Very few bloggers even have a page with rates for this, and only a handful of them are in the education community, so I had very little to work with when setting my rates. So I thought to myself, “How much money would I need to make for it to be worth subjecting allll of my readers to a post about someone else’s product? What amount of money would justify trading in my own voice and perspective to focus on a sponsor?” The answer for me was, a LOT! So I set the price high and stated outright on my sponsor/ad rate page that I would only take one sponsored post feature every six weeks (so as not to inundate my readers.) And I’ve had enough takers to stick to that schedule. It’s worked out really well, because I want quality, not quantity. I would rather have one paid blog post every three months for a lot of money than one every month for a little bit of money. Here’s the way I see it: if you charge more, then you need fewer sponsors, which means fewer ads and fewer paid posts on your blog. Readers like that, and they come first. Watch out for illegal ad and sponsorship requests! Many organizations want to purchase text links not so that people will click through and discover their product/site, but just to use your page’s ranking and reputation as a “quality back link” to improve their search engine ranking. (The more high-quality sites that link to a website, the higher thatwebsite will show up in Google’s index.) They’ll ask to do a link exchange or a 2 for 1 link swap, in which you place one of their links on your site and they’ll place two of yours on their site. Both scenarios are against Google policies because they are considered manipulating page rank: placing links that are unrelated to your content with the intention of making money or falsely increasing a site’s reputation. Avoid at all costs. If anyone asks to purchase a link on your site and offers a ridiculously small sum of money, be skeptical. They’re usually not representing legitimate sites and clients. If they say a paid link can’t use a “no follow” tag, tell them that’s against Google’s policy, and you’re not willing to have your page penalized for their ad. (Again, this is about passing on your page “juice” to other sites and manipulating their page rank.) All paid links on your site MUST use the “no follow” tag. If you don’t know what that means or how to do it, get yourself informed. It’s not as complicated as it sounds, and it’s something you need to know about if you want to make money from your blog. A side note here about paid links embedded in content: be very careful with these. You know what I’m talking about: those times when you’re reading a website and part of the text is a link, but not to a real resource: it’s a link to an ad. Readers don’t like that. There are whole companies set up to embed content links in your site and you can register through them and make money, but your readers will notfeel comfortable clicking links on your site. They won’t know whether they’re going to another page on your site or to an off-site ad. They also won’t know if you linked to a resource because you like it or because you were paid to do it. Even if you use the bottom of a blog post to disclose the fact that you have paid links in your post (which you must do by law), readers don’t know WHICH links are the ads. Therefore, they won’t want to click ANY links, which means less click-throughs and traffic for you. My advice is to always keep paid links separated from content, clearly identified as sponsored links. Do I have to disclose that I have ads on my site? Why? YES! By federal law under the FTC, there MUST be a page on your site which tells that you accept ads and have affiliate links. If you get paid to include a link in a post or review a product, you have to tell your readers in that post. To me, this is common sense: you don’t want to mislead your readers, and it’s a policy I put in my place for myself long before 2009 when it became the law. Readers should know whether you are linking to or writing about something because you find it valuable or because you got paid to mention it. Trust is important, so always disclose any sort of compensation you get! How am I supposed to learn all of this? It’s a lot to take in, I know! I don’t mean to seem all scare-mongering about what the consequences for failing to follow Google or FTC guidelines for ads, but there are so many bloggers that haven’t heard about this stuff and need to know. It’s really important to read social media and marketing blogs to stay current with what’s going on. I don’t proclaim to know everything about the policies and legalities out there, but I’m sharing what I’ve learned so far. Keep in mind that information changes all the time, and ultimately each one of us is responsible for our own content and practices, so stay informed! Pretty much everything I know about monetizing a blog I learned from Googling. So if there is anything on this page you want to know more about, do a search and read other articles on the topic. The more perspectives you have, the better! Don’t expect to be able to pay your bills from being an education blogger. It’s not that kind of niche. Focus on creating great content that teachers enjoy reading and using. The ads and sponsors will eventually become a little bit of extra income each month, the icing on the cake. When you combine your ad and affiliate program income with resources you sell on sites like Teacher’s Notebook and Teachers Pay Teachers, THEN you can make good money. Eventually you may be asked to write posts or columns for other websites, and those can slowly turn into offers for paid writing gigs (although most pay very, very little.) You might also be able to turn your expertise into a book, webinar, or professional development practice and do educational consulting, and you can definitely earn a living that way. There are lots of different possibilities for creating a solid income by creating and sharing things of value for teachers. Keep your focus on making great resources and maintaining your integrity, and the doors will open for you. Thanks for the kind words, Julie! You’re very welcome! This was very informative. I signed up for Amazon Affilitate but wasn’t sure what widget or banner would be best. I also like to promote books like you have but am very techically challenged so I want to make sure I do it correctly. Thank you for writing about this topic. I’ve seen the ads and affiliate programs on the different blogs, but I didn’t know all of the details. I appreciate you taking the time to shed some light on the subject for those of us who are newbies. Thank you! Great tips, I’m just starting out creating my website, which is actually aimed at substitute teachers, like myself. this was really helpful, and let me know what to look out for. Angela thanks for this great piece, very helpful. Thank for you writing this great article. I find it extremely helpful for teachers especially those who like to start blogging and make it sustainable. I was trying to make money from my education blog, that guide helped me a lot.